Pittsburgh is fielding a similar team to last year, and their strategy continues to be the same. There isn’t a big power threat within the offense, and they will rely on putting the ball in play alongside some speed. This is a pesky group, and one pitchers won’t like facing even though there isn’t a big stretch of power hitters. 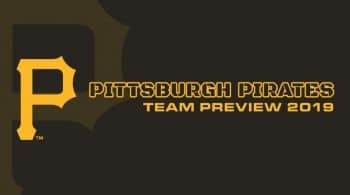 Starling Marte and Corey Dickerson are the highlight bats from this team, and we also get to see Adam Frazier more often in 2019. Pittsburgh will likely use him as a leadoff bat more often than not. Josh Bell will continue to operate at first base, and it is hard seeing power numbers ever coming around at PNC Park for him. Names like Colin Moran and Lonnie Chisenhall will round out the lineup, and it is an average one we might add. We have been dying to see Chris Archer out of the American League East, and that finally happened last season. He moved to Pittsburgh, and he is one of the main reasons why this rotation could be very good. Archer has projections around 190 strikeouts and a mid threes ERA. Archer is a heavy off-speed pitcher, but that has been changing over the last season and a half. He won’t headline the rotation, but he is going to be a very solid number two. With the heavy off-speed stuff, that injury radar is always scary. They floated around league average for an ERA last season, sitting at an even four. Archer has one of the better ERA improvements for his projections this season, and the strikeouts are projected to return. He is a big reason for why Pittsburgh could make a big jump in terms of ERA numbers for the Pirates. They also have Jameson Taillon, who pitched 191 innings last season with a 3.20 ERA. He added a slider mid-year and it was a massive success. He has more strikeout upside than prior seasons, and looks ready to lead this staff for years to come. After Archer and Taillon, things get a little tricky for Pittsburgh. Trevor Williams made a big stride last season. He had 14 wins, and boasted a 3.11 ERA. He had average strikeout stuff, but limited hard-contact as the season got deeper. Williams is expected to regress a bit, but not to being a total gas can either. These backend guys will have the advantage of pitching in a great pitchers park, so it does help for contact arms. Joe Musgrove came over in the Houston deal, and has been banged up the last two years. He is an interesting right-hander if he can stay healthy, but we have yet to really see that. Nick Kingham and Jordan Lyles both will be battling for the fifth rotational spot, and both flashed potential last season. They are not long term options within the team, but Kingham had some strikeout upside at times. This should be a competitive rotation, even against a vastly improved offensive division.